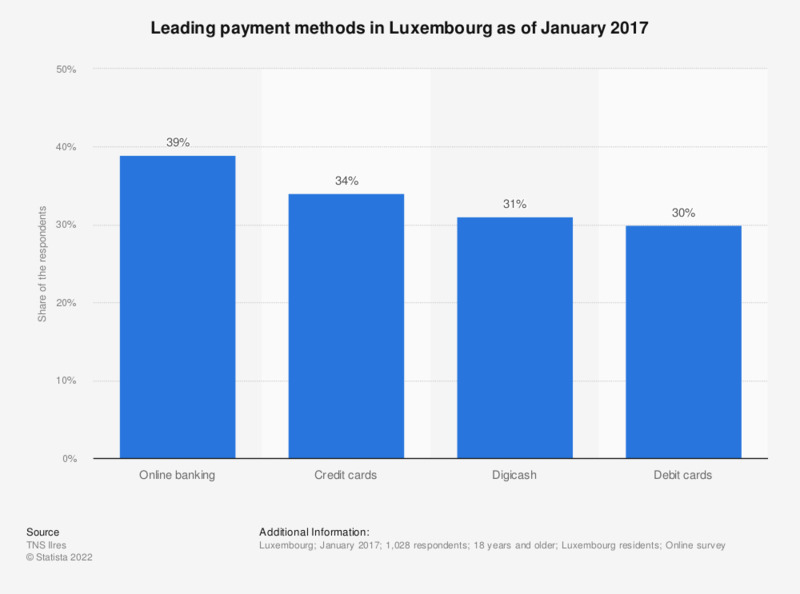 This statistic shows the answers to a survey question on the leading payment methods in Luxembourg as of January 2017. Approximately 39 percent of the respondents indicated online banking was their preferred method of payment. Credit cards followed closely, with a response of approximately 34 percent. Like in other European countries, credit and debit cards are a popular form of digital payment methods for either physical purchases in brick-and-mortar-stores or for online purchases. In 2016, there were approximately 21 POS transactions per card in Luxembourg, compared to 98 in the Netherlands and 67 in Belgium. Consumers from the Benelux are familiar with the use of credit cards. Digicash, listed third in this statistic, is a payments system from Luxembourg finance start-up Digicash Payments. Its mobile app is used by approximately 25 percent of the Grand Duchy's population. In August 2017, Belgian mobile-payment company Payconiq announced the acquisition of this service. The number of available mobile payment apps in the Benelux countries steadily increased in recent years due to domestic banks being involved in their development. * The source does not specify the survey question. It mentions that the respondents "spontaneously" indicated the mentioned methods as their method of payment. (In German: "geben immerhin (...) Prozent der befragten Verbraucher (...) spontan als Zahlungsmethode an"). This could indicate an open question, but the source does not mention this.